The Merriam-Webster dictionary defines the word, humane, as “being marked by compassion, sympathy, or consideration for humans or animals”. This is a good description of Dr. Gary Weitzman, president and CEO of the San Diego Humane Society and SPCA. Giving back to society and helping animals in need has been Dr. Gary Weitzman stated mission in life. He is also following the Jewish law of treating animals humanely. As stated in Judaism 101, “Judaism places great stress on the proper treatment of animals. There is a link between the way one treats animals and one treats human beings” Like Noah, who rescued animals in the bible, Weitzman’s mission is to rescue animals in San Diego County and ensure they receive compassionate treatment. Weitzman came to San Diego in May 2012. In the six years he has been here, he has brought his energy and vision to unify and strengthen all of San Diego County’s animal shelters. On July 1st, 2014, The SDHS and SPCA merged with the Escondido Humane Society and today the SDHS serves the cities of Vista, San Marcos, Oceanside, Poway, and Imperial Beach. As of July 1st, 2018, they will provide services to Carlsbad, Del Mar, Encinitas, Solana Beach and Santee. In addition, they work closely with the East County Animal Rescue as well as the Chula Vista Animal Care Facility, which also serves National City and Lemon Grove. Weitzman has spearheaded what he calls “The Treatable Pet Initiative”. The goal is to save the life of every adoptable animal in the San Diego Animal Welfare Coalition (SDAWC). The final goal, “Getting to Zero”, was met in 2015, five years earlier than projected. Since then, no healthy or treatable animal has been euthanized. Weitzman stated proudly that San Diego County is the largest region in the country to have met that goal. He is also proud that the SDHS merged with PAWS, an organization that provides essential pet services and support to low-income pet families all over San Diego County, including seniors and the disabled. Two of his future goals are to provide services to the homeless people who live in their cars by working with Jewish Family Service and Dreams for Change, and collaborate closely with the new shelter in Tijuana and other animal rescue groups in Baja California. Weitzman, 58, grew up in Boston in an observant, conservative Jewish household. From the time he was a child, he knew he wanted to be a vet and assist others. His family attended a temple led by Rabbi Harold Kushner, author of “When Bad Things Happen to Good People”. Aaron Kushner, the son of Rabbi Kushner, was a friend growing up and it saddened Weitzman to see Aaron’s deterioration and eventual early death from Progeria. Although he loved animals, he could not convince his parents to get a dog until he was 16, but he had many gerbils and hamsters as pets. Ironically, the dog they acquired, a chow mix, became his mother’s faithful companion, a testament to the bond between dog and man. Weitzman received a B.A. in Biology and English from Colby College, an M.A. in Public Health from Boston University’s School of Public Health, and completed his formal education with a Doctorate of Veterinary Medicine from Tufts University. While in Veterinarian school, at age 25, he adopted his second pet dog, a greyhound. Not only did he love the breed, he wanted to give back after having worked on 80 greyhound cadavers while in training. He joined the Air Force in 1993 where he put his Public Health degree to use as he was in charge of food safety, workplace safety, and nuclear safety. He was stationed in both Texas and Washington, D.C. After being relocated to Wyoming for duty, he began to moonlight at an emergency vet clinic in Boulder, Colorado, to which he would drive on weekends. This allowed him to combine both of his passions. He then was “loaned” to the army where he managed a breast cancer research program. He served very actively for four years, and spent another five years in the Air Force reserve. 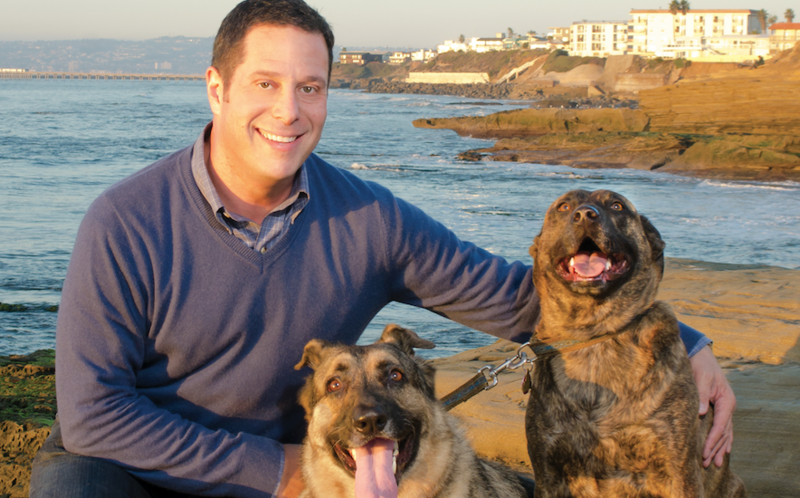 In 1997, he moved to northern California, taking over the practice of a companion animal hospital in Burlingame. He stayed there until 2003 when he was hired as the president and CEO of The Washington Animal Rescue League in Washington, DC. After selling his practice and before moving to Washington, he briefly considered studying to become a rabbi. However, a discussion with the head rabbi at a rabbinical school convinced him that was not to be his subsequent path in life. The next chapter in his life, as president of the Washington Animal Rescue League, was a successful one. During his tenure there, he guided the organization into becoming a national resource for disaster and puppy mill rescues as well as leading a large, urban, homeless animal rehabilitation and adoption center through a period of unprecedented growth. Weitzman stated that he felt satisfied with all that he accomplished during the years he spent there, but he had a longing to return to California, and in May 2012, he accepted when the position of CEO at the San Diego Humane Society was offered to him. Weitzman enjoys his new life in San Diego. He feels that this is one of the best cities in terms of lifestyle. He lives here with his husband, Randy Loewenstein, and his two beloved rescue dogs, Jake, a three legged, very expressive 13 year old German shepherd, and Betty, a calm and sweet 10 year old pit bull mix. On weekends, Weitzman enjoys cooking up his own version of matzo brei. Finally, he believes that as the president of one of the largest shelters in the nation, they have the tools be a role model for others and lead the way in making a difference. He confided that he had never seen a shelter of this caliber and size. There are over 300 employees — most shelters have around 30 — and 150 new positions have opened up. The SDHS is hiring! Very impressive, loved reading how much Dr Weitzman has accomplished in his young life. dog that might fit in my life. I’ve known Gary as a dear and trusted friend since his days in Washington, DC. His intelligence, compassion, joy, great humor and companionship are just some of his many wonderful traits. Whenever I was with him, I always was smiling. I have always admired his desire to make a real difference in this world. And … he’s a big goofball!